Hair on hide brown and cream dream clutch! Time to take the Southwestern trend to whole new level! This hair on hide leather clutch is a unique statement piece that can make your outfit. An uncommon, exquisite fabric in a beautiful color and design, you’ll want to dress like a cowgirl permanently…or be a stand-alone hipster with a killer accessory. It’s obvious that Southwestern style is a big hit for girls everywhere, from sorority sisters to corporate boss-ladies its easy to incorporate turquoise, feathers, and leather into everyday outfits. 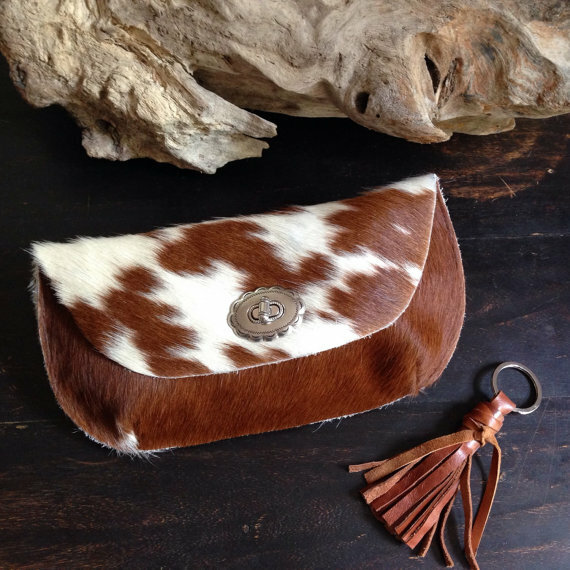 This clutch is the perfect way to add some Southwestern flare and still stand out from the average gal. It doesn’t get more western then authentic cowhide leather, make that hair on hide leather; silver and hassle accents round out the piece. Hair on hide leather is a curious fabric, especially for accessories like purses. 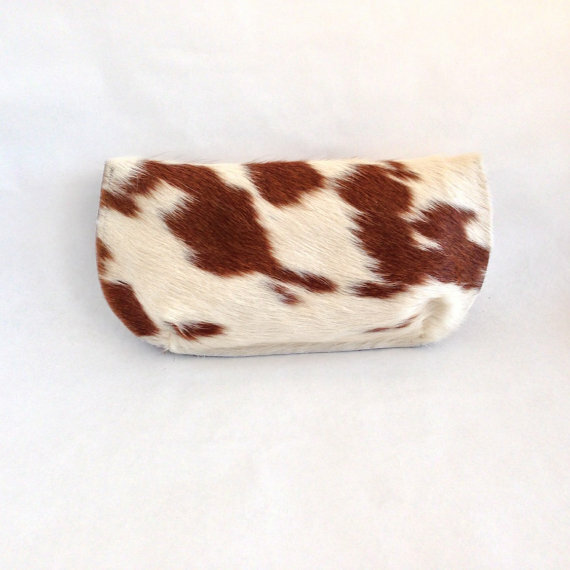 But this clutch pulls off the furry cow look remarkably well. 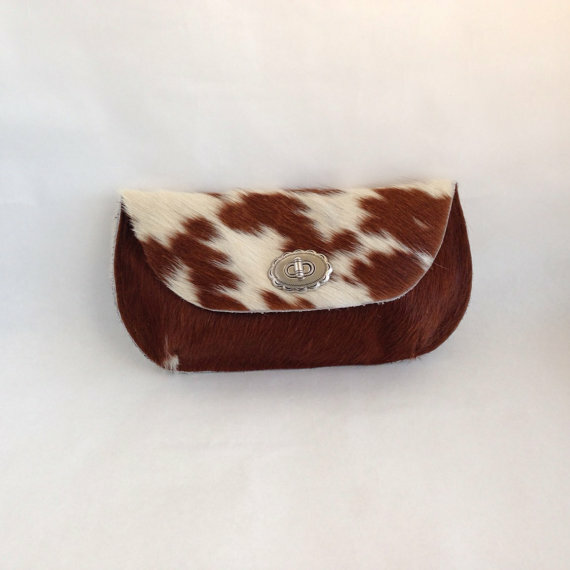 It is a beautiful brown sugar and cream cowhide that speckles the front flap and back of the purse. This is an ideal color scheme to match with most other Southwestern trimmings like bronze jewelry featuring coral, turquoise, and feathers, or rocking leather cowboy-inspired boots with Levis. Dress up jeans, or finalize your southwestern vibes! 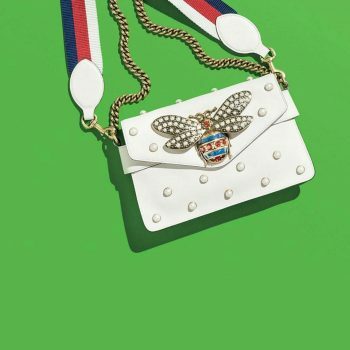 Speaking of other Southwestern trimmings, the embellishments that accessorize this clutch makes it the whole package. 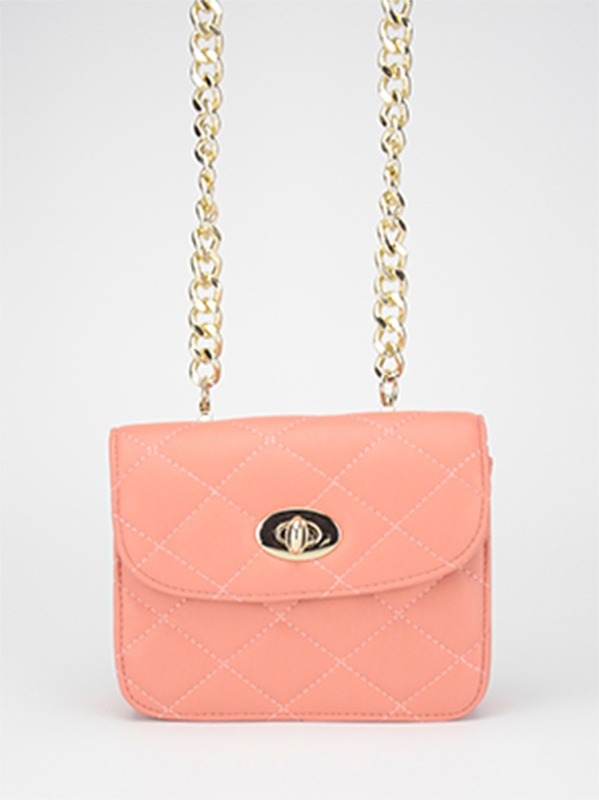 The silver clasp that closes the fold-over flap to main purse is a cute oval rosette. Not too feminine, and not too harsh, it adds increased western verve. 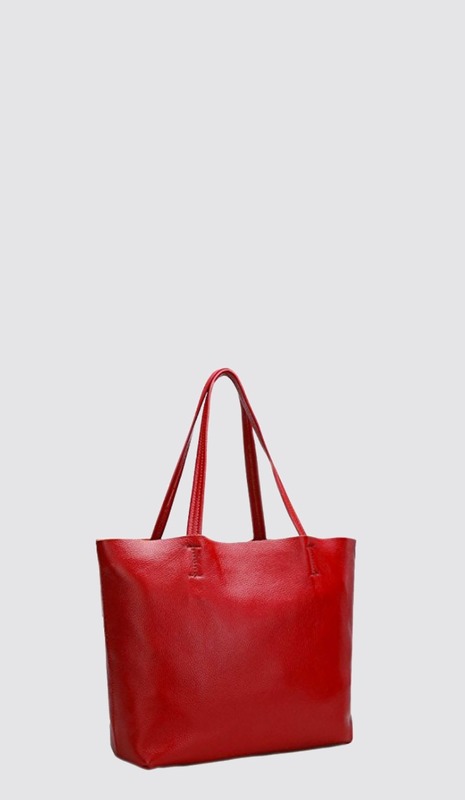 It also come accompanied with a leather tassle keychain attachment in a matching brown to top off your look. Silver western clasp to lock up your clutch tight! 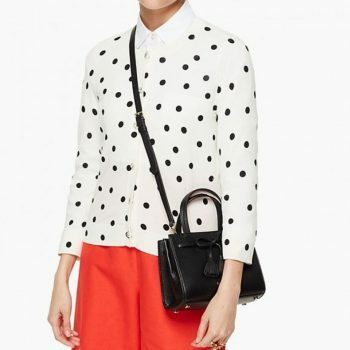 Not only does this clutch have great material, but it also has great style with its elliptical fold-over flap. Instead of having a boring zipper at the top, the flap allows for the accent clasp and dresses the clutch up. Plus all your essentials are safe, but easy to get to even thought this clutch is surprisingly roomy. It is 10.5 inches long and 6 inches high, so you will have no problem stashing your phone, credit cards, cash and keys. 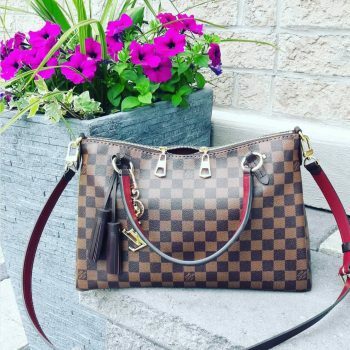 Perfect clutch for a night out on the town or impressing on a first date! 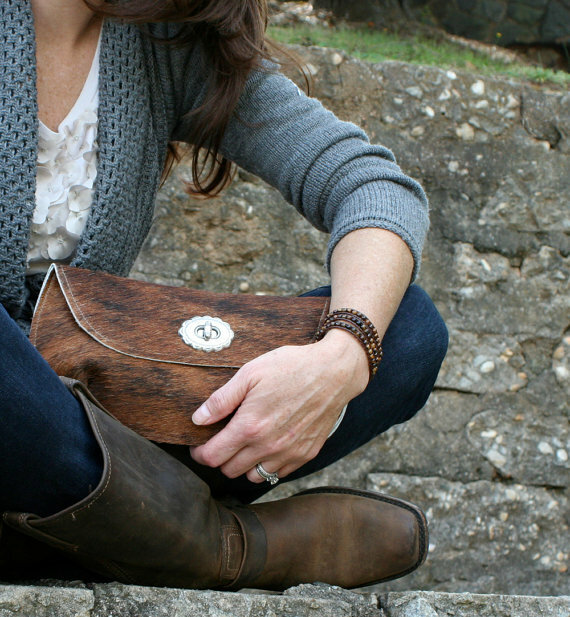 Whether you’re just jumping on the Southwestern style bandwagon or if you’re adding to your collection and want an item to top it off with an awesome piece, this clutch is the answer to to all of those needs. A unique and beautiful hair on hide leather clutch in brown and cream that will be the envy of all of your friends and the best accessory you’ve ever carried. 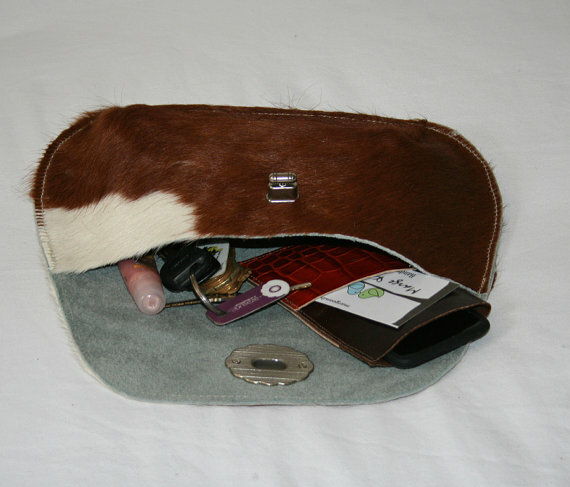 MargeAndRudy has other great leather bags, including more hair on hide.